ECEEN Solar Hydration Backpack 7 Watts Solar Phone Charger with 2 Liters Bladder for iPhone Samsung,,ECEEN Electronic limited. 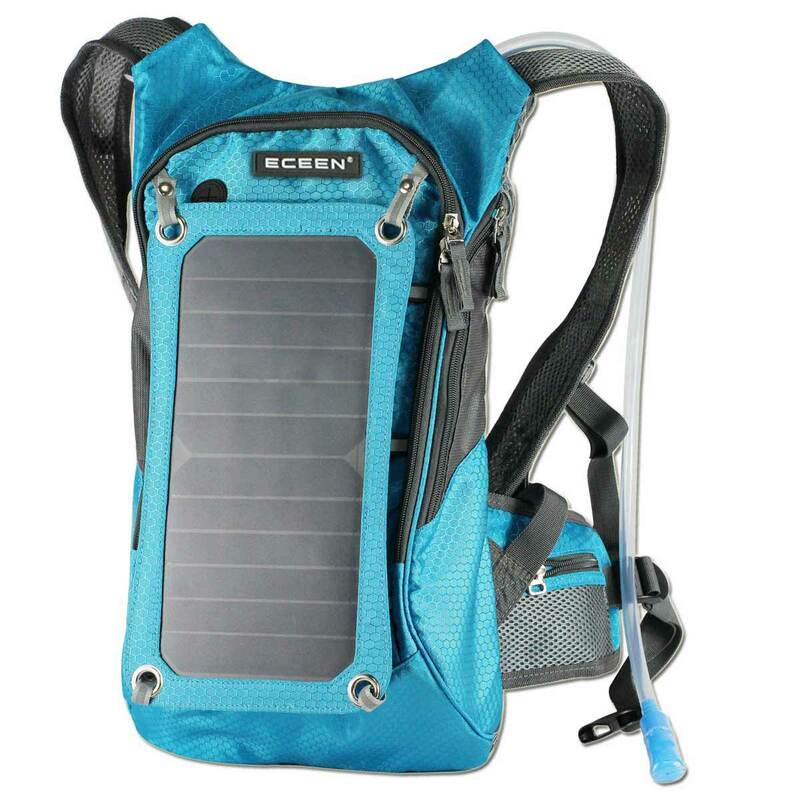 BE ACTIVELY ENERGY EFFICIENT: Please noted that this item not include “BATTTERY PACK”; Enjoy nature and preserve it at the same time with ECEEN 7W Solar Backpack. Ideal for holding backpacking supplies, as well as hiking, biking, or camping, the light, portable pack can hold and charge all your small mobile essentials using solar energy with the attached solar panel and our Voltage Stability Controller. That's what we like to call proactive, literally. PROTECT YOURSELF, YOUR PLANET AND YOUR DEVICES: Why not to love? Put safety first with this mobile phone charger, ensuring you're never left with a dead battery in an emergency. Utilize clean, natural energy from the sun to power your devices, on the road or at home; anywhere you have direct sunlight. And prevent damage to your devices while traveling by tucking them in one of the perfectly sized and secure compartments of the durable backpack. STAY CONNECTED, OFF THE GRID: Whether you are bringing along a tablet for GPS, a phone for photography, or an iPod for some motivating music, ECEEN solar charger travel backpack will keep the juice flowing with high-efficiency 22% transfer rate solar cells, a 5V USB port, and protective Voltage Stability Control, which prevents unstable or damaging currents. Your search for the perfect camping backpack is officially over. KNOW THE FACTS: Solar power is abundant, clean, renewable, and effective. In fact, each hour, enough sunlight reaches the earth's surface to provide for the world's energy demand for a year. ECEEN, as a professional manufacturer of solar products, we have been committed to manufacture energy savings, green and modern solar products. Come on! We already prepared ECEEN Solar Cycling Hydration Backpack for your outdoor sports next time. DEPEND ON DURABILITY: Crafted to withstand adventure, the solar power backpack is more than a solar battery charger. It is also a bladder backpack, with a 1.8L hydration pack and a plethora of pockets and compartments. The sport quality weather proof PVC fabric guarantees top performance and reliability, and weighs less than 3 lb. overall. ECEEN backpack is a necessary eco friendly addition to your hiking gear or camping accessories. ECEEN Water Backpack, Solar Powered Bicycle Backpack has all of the functionality and design of a well-equipped backpack, with the addition of a Green, Earth-friendly solar charging module. The Solar camel bag has 1.8 litres water bag inside, allowing you to hydrate any time during your ride. The front flap features a light-weight, flexible, integrated solar charger for your cell phone, iPad or tablet for the times when you don't have a power outlet. 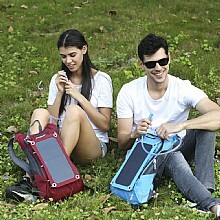 Solar Power Bag has a powerful innovative solar panel that charges a dead cell phone very quickly, as well as tablets and many mobile electronic chargeable devices. 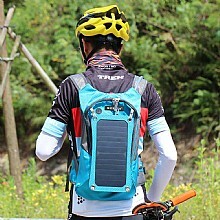 Solar Power Bag saves you from being in a powerless situation during your ride. The powerful, lightweight removable panel is designed with the latest solar panel technology. You gotta get this! Especially if you like to ride your bike everywhere or go hiking, the battery pack can charge my galaxy s5 from 20% to 100% once. Which isn't too shabby, i usually have a second smaller one inside when i carry this around). The water pouch is usable, but do yourself a favor get a nice one from sports authority or dicks, or even Walmart(one with a cap on the mouth piece, i find mine hitting the dirt during a hike when i sit down for a rest or the floor when i set it on the ground). The bag itself has plenty of room, enough for me to pack a netbook, the charger, a small pouch of cords, the battery pack, a smaller battery pack, my go pro, and 2 granola bars on the side pocket with a pen and a knife. all fitting comfortably on my back. Bought this for my spring break trip in Florida! The bag as a whole is great, and it's awesome that it comes with a huge battery pack to boot. 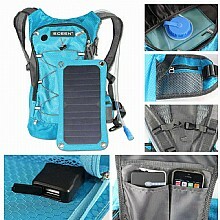 - Solar charger section has its own pocket. - I really dig the color. - The straps have no padding. It's not a huge deal, but they're very thin and can slide off the shoulders easily. - There is no place to store the nozzle when not in use, which is a bummer since I'll be having this on the beach. I would definitely recommend this bag. It provides the ease of mind regarding battery life, and the hydration pack is a huge plus. Just a couple of small things here and there and it would be perfect! 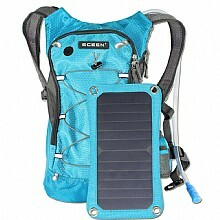 Solar Panel + Hydration Bladder in a Backpack. What more do you need? I was able to charge my iPhone and Galaxy Tab 3 using the supplied battery pack and charging was at speed comparable to other battery packs. If you try to use solely the solar panel, it will take much longer so make sure your 10,000mAh battery is fully charged before heading out. 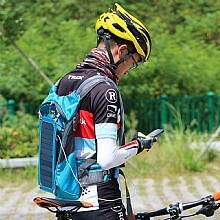 The solar panel can be used as a last resort, a sort of emergency charger if the included battery pack dies. The ideal usage would be to use the solar panel to trickle charge the battery pack and at the same time, use the battery pack to charge your devices. This is a great bag for anybody who loves the outdoors but at the same time wants to remain connected to the world. The hydration bladder eliminates the need to carry around water bottles. Nice waterproof, reflective, rugged material should last for years to come.